Scout News Reporter program recognizes those individuals who contact a news media or send them a news release, which in turn gets a positive Scouting story or photo published in an approved publication. Click here for the form and more details. 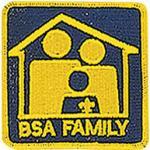 The BSA Family Award program includes a series of activities designed to help strengthen all families--whether two-parent, single-parent, or nontraditional. This program was designed to help families accomplish worthy goals while building and strengthening relationships among family members. All family members are encouraged to participate and may earn the award. Click here for details. Tiger Cubs, Wolf and Bear Cub Scouts, and Webelos Scouts have the opportunity to earn the Cub Scout Outdoor Activity Award. This award recognizes the Scout for taking part in outdoor recreation and conservation projects. In many cases, you can earn this award while doing other Scouting activities. Boys may earn the award in each of the program years as long as the requirements are completed each year. Click here for the requirements. The World Conservation Award provides an opportunity for individual Cub Scouts to "think globally" and "act locally" to preserve and improve our environment. This program is designed to make youth members aware that all nations are closely related through natural resources and that we are interdependent with our world environment. Click here for details. "Emergency preparedness" means being ready for all kinds of emergencies. It means you're ready and able to help in times of trouble to save lives and property and to help a community—or even a nation—get back to normal after a disaster happens. To encourage Scouts of all ages to be prepared for emergencies, the BSA has approved an Emergency Preparedness Award program for members of all ages. Click here for details.